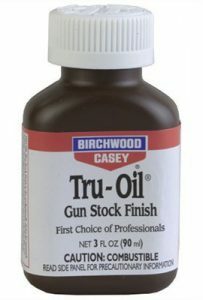 Tru-Oil from Birchwood Casey is my absolute favorite wood finish. Not only does it enhance the natural beauty of wood, but it is also extremely easy to apply. This is what has made it my go-to finish for a very long time. Everything from smaller projects to medium sized applications like guitars, Tru-Oil delivers. 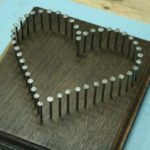 This finish is inexpensive, and can be used on any wooden surface with success. 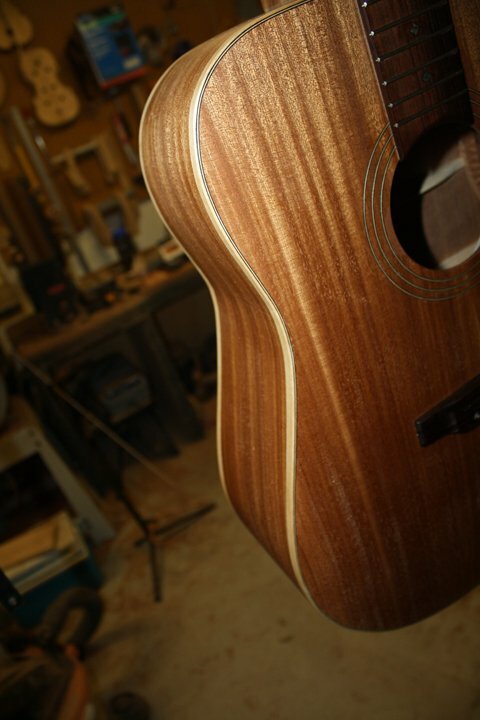 Tru-Oil has been my finish of choice for acoustic guitars for years, because it is the perfect blend of beauty and protection for wood projects. It goes on easily with a clean cloth, and dries quickly enough to apply several coats in one day. Tru-Oil will make an expert finisher out of anyone in a very short time, and the resulting finish will look professional. In the beginning, it’s important to find a finish that you can work with, and learn quickly. Tru-Oil is that finish, and in a very short time you can become an expert. Tru-Oil is a polymerized oil, which is a fancy term for an oil that has been cooked to cross link the molecules and help it dry faster when exposed to air. The trick to helping that drying process is to apply very thin coats. Thinner coats dry faster, leave a smoother surface, and prevent situations where the finish looks blotchy or uneven. 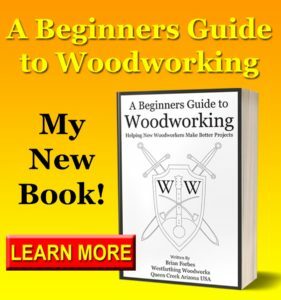 For more about thin coats, take a look at The Secret to Wood Finishing. I bet you guessed what it is already, but it’s worth a read anyway. The best applicator for Tru-Oil is a clean cotton cloth like an undershirt. I typically take older undershirts that have been laundered and cut out 4″ x 4″ squares from the chest and back area, avoiding the armpits and neck portions of the shirt. These areas tend to have debris, deodorant residue, and other chemicals that you don’t want in your finish. I fold these in half twice and that becomes my finish applicator pad. Press the pad tightly on the mouth of the open bottle and tip it over briefly to get some of the finish on the pad. The pad is then used to transfer the finish to the piece, and whenever you need more finish all you have to do is repeat the process on the mouth of the bottle again. Work in small areas applying the finish, and spread it around until it is very thin. You should not see any thickness in the finish on the surface, is should almost look like you got the wood wet, but it all soaked into the surface. 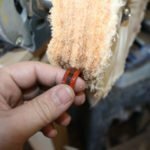 Once the pad will not go any farther, dab more finish from the bottle and repeat, expanding the part of the wood that has finish on it. When the whole piece has a uniform coat, it can be set aside to dry before the next coat. When I say thin coats, I mean extremely thin coats that just look like you got the surface wet. There should be no liquid residue on the surface that looks like a layer of water, it should all look like it has soaked into the wood. Apply the finish thinly. It will dry faster, and you can coat it again quicker. It will also self level, which is the real secret. If you have to spend half a day smoothing out the finish you just applied, then you are doing double the work, and adding unnecessary time. If you want an expert look, apply those coats very thinly. 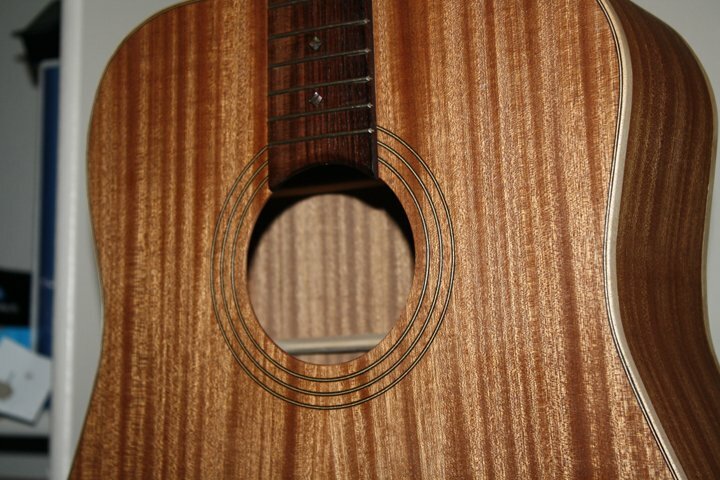 Prep the guitar or wooden project by sanding to 220 grit and removing all scratches. Wipe the piece down with a clean cloth or blow it with an air nozzle to remove all dust from the surface. Apply the first coat on the surface very thinly and evenly. Tru-Oil will amber slightly with multiple coats, which gives a warm look. Keep on applying coats until you have the look you are after (at least three-four). Allow the piece to dry for a whole day, then lightly steel wool with 0000 grade wool. Afterwards, wipe off the dust. Apply one final very thin coat to restore the gloss, and allow the piece to remain untouched for a few days to a week. The finish companies want you to buy their products. They have actually found that people will buy one finish over another because it dries faster. They have creative ways of getting their products to dry quicker than normal, like a controlled temperature room that is warm with very low humidity. Both of these factors encourage a finish to dry quicker. Tru-Oil takes about 2-4 hours to dry enough for a second coat. This is longer in humid and cold places, and shorter in warm dry places. After a couple hours, lightly touch the piece. You should be able to slide a finger around without sticking. If there is still a strong smell from the piece, the finish is still too wet. Put the piece somewhere with ventilation. A small fan to circulate air helps too. Don’t blow it around too much though. You do not want dust getting on the still wet finish. 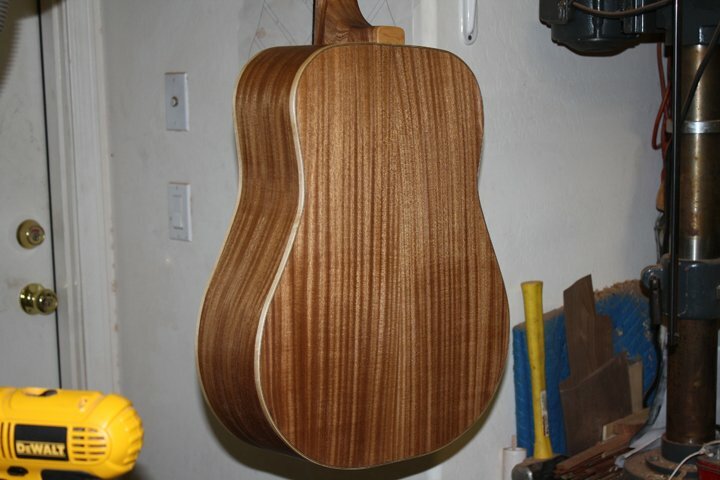 A basic rule is that if you can still smell the solvent, the finish is still curing. Let the piece cure. It will be worth it to have a strong finish for many years to come. The curing time will vary depending on environment as well, however a few days to a week is typically enough time. If you can still smell the finish, it has not cured yet. Any questions about Tru-Oil finishing, please feel free to add them in the comments and I will answer them. I want to finish my mountain dulcimer with tru oil but have not found just how much is needed to do it. Thank you Maynard, your dulcimer will not need much tru-oil to finish the instrument. I finish several acoustic guitars from one small bottle of tru-oil, so you are definitely safe. Let me know if you have any questions as you go, and I will be glad to help you with them. Happy building. Thanks for the post. Just received a new maple guitar neck and was looking for a simple and effective way to finish and protect it. Looks like tru-oil is just the ticket – excited to try it! Thank you Matt. You are going to love working with Tru-Oil. It’s super easy to apply, easy to repair, and leaves a great looking finish. If you are new to finishing, try it on a test piece to get the process down, and then once you are good on the test piece you will be ready for the real thing. Apply really thin coats, and build up your finish slowly. Thank you again, and happy building. Hello and thank you for this helpful article! I’m curious about how long the Tru-Oil finish will hold up on an electric guitar body. I’m working on a kit body which I plan to sand and stain then apply Tru-Oil. I recall reading somewhere or hearing that Tru Oil is not a permanent finish but I’m not sure how true this is. Any insight would be greatly appreciated! Thank you for the question Matt. I have finished several guitars with Tru-Oil and have never had anything go wrong either during or after the finish. Some of these have been in use for over a decade, both acoustic and electric. The finish itself is not as strong as a lacquer or a poly, but the look is also very different too. A guitar finished in tru-oil needs to be handled a little easier, because it can scratch faster and liquids can harm the finish faster. As long as you are not being overly rough with your guitar, you will be happy with tru-oil. As far as being permanent, the finishes are still on my guitars even after all this time. Tru-Oil is a polymerized oil, so it’s basically a plant oil that has been cooked at a high temperature to help the molecules link to each other. This is why it dries so well on the surface where other oils sink in more. The coating is definitely there, and it definitely does not come off over time. It almost applies like a wiping varnish, forming a layer on the surface. If you have any additional questions, please let me know, and best of luck with your guitar. Apply super thin coats, and you will have a great looking finish in the end. Happy building. Most instructions for Tru-Oil says sand between coats. Yours says to apply several coats before sanding. I’m A Little confused. Thank you for the comment O.P., I have always applied a few coats of Tru-Oil before sanding, and have had great results every time. I also apply super thin coats, almost to the point of wiping just a wet layer on the surface and removing everything else. This means the actual individual coats are thinner than normal. The finish sticks to itself really well, so after a few to several coats, that’s when I scuff or sand. I’ve done a couple dozen guitars with this exact process, and every one of them came out great. Don’t worry too much, just apply very thin coats, and wool near the end before the final coat. 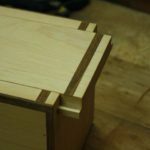 If you want to sand between them, you can do that too, just go very very lightly so you don’t go through the finish and down to the wood. With super thin coats, it does not take much to break right through the layer. Happy building. 1) How does Tru-Oil change the tonal qualities (sound, sustain) on a guitar/ukulele compared to other finishes that you’ve experience with, in particular shellac and other oil finishes. 2) Would you recommend to fill the grain before a Tru-Oil finish and what’s a good way to do it (Wood filler paste / pumice+shellac / natural light sanding dust+shellac…)? 3) I’m after a minimalistic natural look that shows the grain and figure of the wood as close to unfinished as possible without discoloring too much. Gloss is not required but OK . How likely will I be happy with Tru Oil and would you recommend another finish. Thanks for the question Pablo. I don’t use a thinner for Tru-Oil, and never have. I’ve never really looked into it, but I do know that the product goes on super smooth and is loose enough that you can get a good coat by wiping. It also dries slowly enough that you can go over the same area multiple times without the surface getting tacky. This stuff applies like a wiping varnish, so it’s a super easy process and doesn’t require any thinning. Thank you again, and happy building! Thank you Christian. Tru-Oil sits on the surface of the wood like a varnish, so in heavy coatings and multiple coatings (really going overboard) it can restrict plate movement a little. You really have to go nuts to make that happen though, and a few coats like normal will not make a difference. If you like the open grain look, then don’t fill them. If you want a flat look, fill them. I like the open look, so I leave mine natural before applying the tru-oil. Lastly, tru-oil does impart a little color, but it is very light with normal coating. Coat after coat, it will add a touch of amber, almost like a really light shellac would. I personally love the color addition, and it’s very subtle. Happy building. Can you stain before applying? Thank you for the comment Larry, you absolutely can stain before you apply Tru-Oil. Make sure that your stain has completely dried before adding the Tru-Oil. Let me know if you need anything else and I’ll help. Happy building. Someone told me tru oil needs UV light to cure properly.. Is this true? I ask because I wonder if it would be good to use in the bore of my native American style flutes.. Thank you for the comment Terry. You do not need UV light to cure Tru-Oil. It will cure all by itself. As long as you can get some sir flow into your flutes, your oil will cure. Happy building. I have been finishing fretboards with tru-oil. The instructions I have recommend using BW Casey Gunstock Sealer & Filler (2-3 coats) followed by several coats of Tru-Oil. I apply both before installing the frets and fill the fret slots with Teflon “Dam” material cut to fit in order to keep the sealer and tru-oil from getting in the slots and interfering with the contact adhesive I use to hold the frets in (I found that not gluing the frets meant needing to glue many of them later). 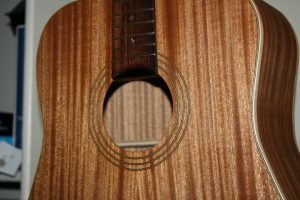 The problem I have had comes invariably when filing the fret ends or leveling the frets. There always seem to be some scratches or worse marring the surface or sides of the fret board, even when I mask off the finished surface with low grip tape and use metal shields over the frets. When I end up sanding the spaces between frets and re-applying the tru-Oil the result is never satisfactory. Should I apply the frets and then apply the finish? Thank you for the comment Seth. I have always fully completed my necks before applying Tru-Oil. I can see the virtues in doing it differently, but I have just never deviated from my process. I recommend that you do everything you need to do with your tools and shaping the frets before you finish. Then, when you do apply the finish, you don’t have to worry about damage or unsatisfactory repairs. Also, you don’t need a lot of product on the fretboard. A couple thin coats will be fine. The back of the neck is the same, because you don’t want it to become sticky when you play and sweat. Please let me know if I can help further, and happy building. Thank you so much for this information! I do have a question though; Can you safely tint or dye Tru Oil? I’ve seen folks on YouTube add artist grade oil paint to Tru Oil to give it a slight color. It looks fine but I wonder if it changes the application, drying, waiting process? Have you done this yourself or used a different method for tinting Tru Oil? Thank you Sean. I have a video here: https://www.youtube.com/watch?v=L5nXwKROhZg that explains the entire process. This should cover everything, and if you have any questions please let me know and I will be glad to help. Happy building. So happy to have found this site! Thank you!. Have a solid mahogany body for a Tele- kit. Do I only need to sand it a bit more before putting on the 1st coat of the Tru-Oil? Thank you again! Thanks for the comment Larry. If you have an unfinished body, then all you need to do is prepare it for a finish like any other project. Do a nice sanding, address and defects or divots, and get it nice and smooth. After that, you are ready to apply Tru-Oil. 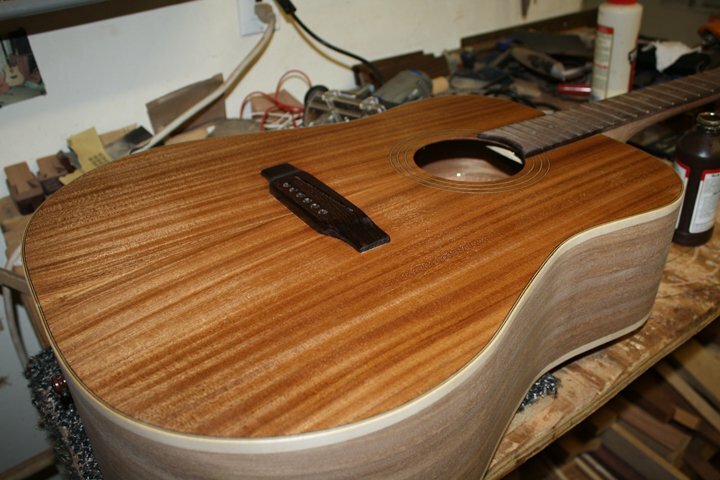 Apply very thin coats, give them ample time to dry, and you will have an easy time finishing your guitar. Email me if you need help, and happy building. What about wet sanding? Either every three or four coats or at the end? And if wet sanded, his would I achieve a high gloss? I’ve seen guitars that were tru-oiled and very glossy, but no one seems to be able to explain. Thank you for the comment Phil. Tru-Oil sets up on the surface like a varnish, and builds a coat. This is different than an oil, and you can take advantage of this property to get a really high sheen like you mention. There are a couple ways to do this. First, you can apply one final really thin coat of Tru-Oil after you steel wool the first several coats level. This will restore the gloss, and give a nice, shiny look. 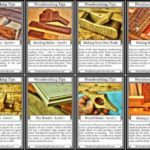 The other method is to apply several layers, a few more than normal, and then wait a couple weeks until the finish has fully cured. Steel wool very lightly to even out the surface, and then buff with polishing compounds or hand rub the finish to a high sheen. You can make the piece look so glossy that it looks wet if you use polishing compounds and a buffing wheel. You can get the same thing by hand with compound and a rag, but it will take a much longer time. 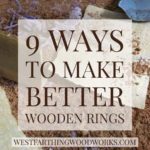 I have a post you can search called “How to Buff Wood to a High Sheen” and it shows the process on bare wood but you can do the same thing to a finish and get an incredible gloss. I hope that helps. If you have any more questions please let me know and I will be glad to help. Happy building. Thank you Jim. I never scrape off the finish. I always finish with the bridge in place, and it’s been a perfectly good method for a lot of guitars. I have never really seen the benefit to doing it like that, so for me the bridge and neck have always been attached. That being said, make sure you apply a little less finish to the bridge area and the fretboard. The back of the neck can take less too. The neck really doesn’t need as much as the body, and it can get sticky if your hands sweat, so don’t over do it. 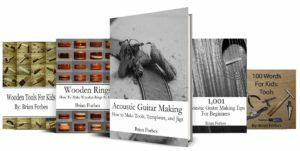 I’ve finished nearly all of my guitars in one piece, and it’s super easy. Plus, no scraping off the finish after you applied it. If you have any questions please let me know, and happy building. I’m sorry if you already answered this question but can you use Tru Oil over oil based stain? Thank you Bernie. You can use Tru Oil over nearly anything as long as it is fully cured before adding the oil. Since I don’t know your exact circumstances, I always recommend a test board first just to make sure everything is working right. Once you get past that, you can proceed to your project without any worry. I have applied Tru-Oil over lots of stains, and it’s been fine, though again a test board is the best weapon against a huge screw up. Happy building.